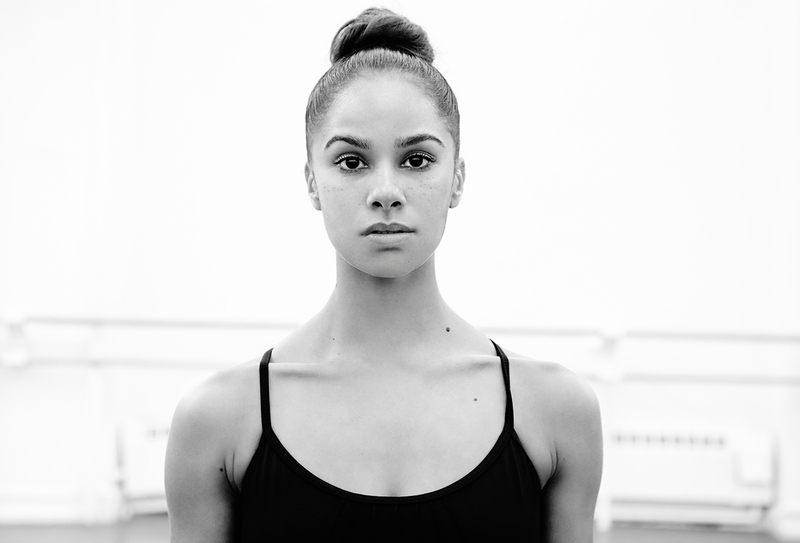 Born in Kansas City, Missouri and raised in San Pedro, California, Misty Copeland began her ballet studies at the age of 13 at the San Pedro City Ballet. At the age of fifteen she won first place in the Music Center Spotlight Awards. She then began her studies at the Lauridsen Ballet Center. Copeland has studied at the San Francisco Ballet School and American Ballet Theatre’s Summer Intensive on full scholarship and was declared ABT’s National Coca-Cola Scholar in 2000. Copeland joined ABT’s Studio Company in September 2000, then joined American Ballet Theatre as a member of the corps de ballet in April 2001. She was appointed a Soloist in August 2007 and a Principal Dancer in August 2015. Her roles with the Company include Gamzatti, a Shade and the Lead D’Jampe in La Bayadère, a leading role in Birthday Offering, Milkmaid in The Bright Stream, the Fairy Autumn in Frederick Ashton’s Cinderella, Blossom in James Kudelka’s Cinderella, Swanilda and the Mazurka Lady in Coppélia, Gulnare and an Odalisque in Le Corsaire, Mercedes, Driad Queen, the lead gypsy and a flower girl in Don Quixote, Duo Concertant, the Masks in Christopher Wheeldon’s VIII, the Firebird in Alexei Ratmansky’s Firebird, Flower Girl in Gaîté Parisienne, Zulma and the peasant pas de deux in Giselle, Queen of Shemakhan in The Golden Cockerel, the Waltz in Les Sylphides, Lescaut’s Mistress in Manon, Clara the Princess, Columbine and one of The Nutcracker’s Sisters in Alexei Ratmansky’s The Nutcracker, Bianca in Othello, a Gypsy in Petrouchka, the Lead Polovtsian Girl in the Polovtsian Dances from Prince Igor, the Saracen Dancer in Raymonda, Cowgirl in Rodeo, Juliet and a Harlot in Romeo and Juliet, Princess Florine in The Sleeping Beauty, Odette-Odile, the pas de trios, a cygnet and the Hungarian Princess in Swan Lake, the Tchaikovsky Pas de Deux, leading roles in Bach Partita, The Brahms-Haydn Variations, Monotones I and Symphonic Variations and roles in Airs, Amazed in Burning Dreams, Baker’s Dozen, Ballo della Regina, Birthday Offering, Black Tuesday, The Brahms-Haydn Variations, Brief Fling, Company B, Désir, Gong, Hereafter, In the Upper Room, Overgrown Path, Pretty Good Year, Private Light, Raymonda Divertissements, Sechs Tänze, Sinatra Suite, Sinfonietta, Thirteen Diversions, Within You Without You: A Tribute to George Harrison and workwithinwork. Copeland created His Loss in AfterEffect, the Spanish Dance in Ratmansky’s The Nutcracker, the Fairy Fleur de farine (Wheat flower) in Ratmansky’s The Sleeping Beauty and leading roles in C. to C. (Close to Chuck), Dumbarton, Glow – Stop, Her Notes, One of Three and With a Chance of Rain.